Optimizo is very proud of the trusting relationships we have built over the years with our clients across North America. We are grateful for their testimonials and would be pleased to provide references upon request to speak with any of these executives. RSG is a Texas-based distributor of roofing supplies, with over $1.0 billion in revenue and a sales force of 200 sales representatives. The challenge for RSG was sales management and helping reps deal with price pressures. Optimizo came in and helped RSG to develop and launch a new fully customized sales process which ultimately generated a revenue growth of 19% and a margin increase of 2%. In 2012, the CEO of RSG and their partners at the Sterling Group hired Optimizo to help them align their operations, develop and implement new processes and instill an evolved sales management culture. With a substantial and scattered salesforce as well as challenges in leadership management at the branch level, RSG felt the need to optimize its sales process through extensive sales training and key customer value driver identification while building on its customer-centric approach, a key strength at RSG. 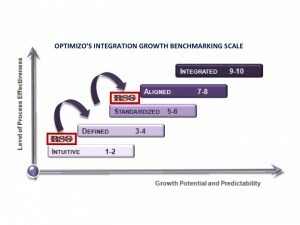 Through an extensive interview process with key stakeholders and rigorous data mining and analytics, Optimizo discovered eye-opening trends and patterns which allowed RSG to rethink its Go-To-Market approach, make the necessary adjustments to its sales process and tightly package its offer to demonstrate value to customers. Objectives were attainable with clear steps and Optimizo’s help in finding the right training program and vendor also contributed to RSG moving upward on the Integration Growth Benchmarking Scale. 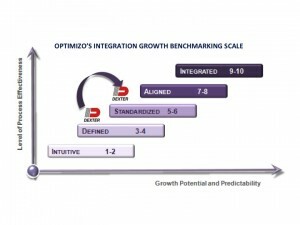 In fact, through Optimizo’s continued support, RSG went from an initial score of 1.5 to a score of 7 within 18 months. Through these concerted efforts and relentless collaboration, RSG reached its ambitious sales objectives which represented a 10.5% increase in sales. 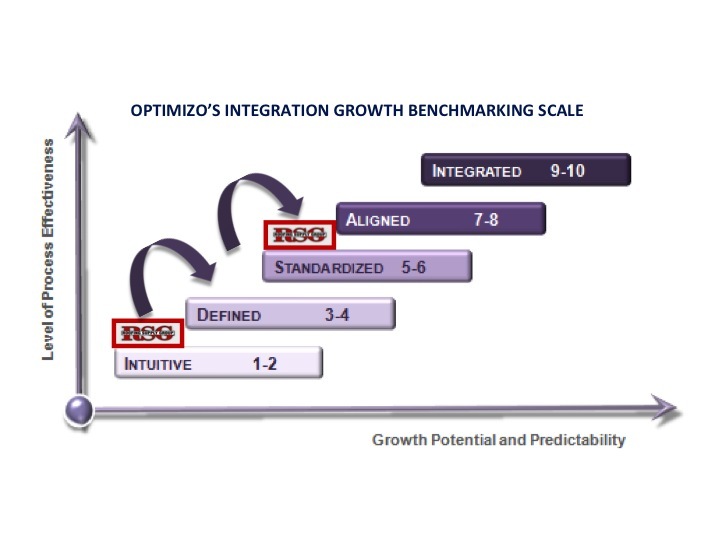 RSG also achieved 2 extra margin points by scaling higher levels on the Optimizo Integration Growth Benchmarking Scale, thereby increasing its resale value for investors. Dexter is a leading manufacturer of axles, with sales of over $350 million and a network of 350 distributors worldwide. This successful and growing company was seeking to expand into new segments and Optimizo helped Dexter by developing more formalized marketing processes and a new sales management structure that generated a sales funnel increase of 30% in the first 6 months. In line with its continuous improvement philosophy, Dexter Axle, a very successful and disciplined company, wanted to improve its Front-End processes in order to leverage its unique strengths and ensure its continued financial growth. As such, Dexter realized that marketing planning and budgeting processes were somewhat intuitive and company executives felt the need to align marketing efforts with the sales representatives’ sales cycle. In addition, Dexter wanted to speed up its innovation product development process for key strategic products and better manage its innovation funnel. Based on its 360 degree diagnostic, Optimizo co-created tailored solutions to align Dexter’s Front-End processes through the alignment of the sales, marketing and innovation funnels, a process which was later branded internally as the F.O.C.U.S. growth process (Funnel Opportunity Consistent & Unified Strategy). Optimizo’s diagnostic services also helped unearth ways of making the sales cycle even more efficient and provide optimal sales coverage and marketing structures for the company. Optimizo’s exclusive support solutions facilitated the implementation of new stage-gated processes and KPIs which allowed Dexter to standardize its selling approach and create an efficient sales management process. Finally, Optimizo’s unique collaborative approach and execution tools helped Dexter to develop a customized and market-driven segmentation strategy that directly contributed to increase its market share. All these combined efforts resulted in an 18% organic sales growth born from Dexter’s pre-existing strengths which also generated 15-20 extra share points. Dexter also increased its market share from 40% to 70% while dramatically increasing its prospecting sales funnel by 30% in just a few months.